Steam a squash for a half hour until it’s tender. Split it open and hollow it out. Mash the pulp together with tofu and sauté it in olive oil, together with salt, onion, celery, pepper and carrot. Add in cornstarch, parsley, bread crumbs and wakame seaweed. Sprinkle with breadcrumbs and bake for 40 minutes. Serve with tartar sauce. 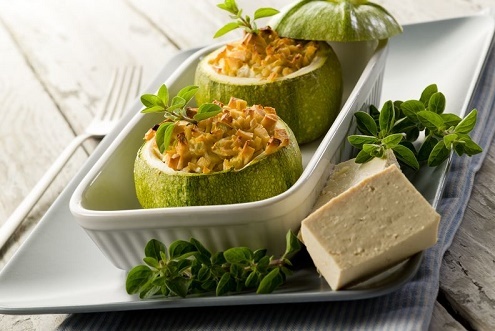 While each of these recipe specifies zucchini, squash or another vegetable, you can easily switch one for the other, depending on what’s available to you.